Sometimes we derive comfort merely from knowing that a special place exists. For me, one such place is Yellowstone. The phrase “love at first sight” is not too extreme to describe my exhilaration the first time I passed through the Roosevelt Gate and encountered pronghorn, bison, elk, and swans all within a few minutes. I was captivated by Yellowstone’s geological features, too—not just geysers, but hot pools alive with colorful swirls of microorganisms thriving in conditions fatal to most life forms. Everywhere, Yellowstone is dynamic and alive, both above and below ground. I revel in watching Yellowstone’s renowned Old Faithful as it builds towards eruption. When an eruption nears, streams of water leap into the air with increasing frequency and visitors begin to gather around. Whether performing for an audience or not, Old Faithful is, as its name indicates, faithful, and soon is in full eruption. Water and steam pirouette upwards in an unforgettable display—one I’m watching from 1,400 miles east of Yellowstone via a webcam. Without leaving my desk, I’m transported to Yellowstone, my thoughts overflowing with images of bison grazing in the Lamar Valley. The recall is so powerful, I can almost smell the sulfurous mud pots or touch fissures scratched into a tree by a bear. Watching the Old Faithful camera leaves me feeling reassured that a vestige of North American wilderness thrives, largely oblivious to the constructed world in which I function. No one is more surprised than I that this warm, fuzzy nature moment is made possible by technology. I consider myself a Luddite. I tend to find technology challenging, even annoying. When I first heard the term “Luddite” as a young adult, I had no idea what it meant. I wondered if it referred to fans of Allen Ludden, the late husband of Betty White. A television personality in his own right, he hosted the popular game show Password in the 1960s and 70s. But Luddite actually refers to an early-nineteenth-century group that protested the replacement of skilled laborers by machinery. While the Luddite movement was more pro-labor than anti-technology, Luddite, in contemporary usage, has come to refer to someone less than enthusiastic about technology. And for the most part, that’s an apt description of me. I feel technology too often takes the place of the real in contemporary society, substituting for actual contact between people or between people and nature. We’ve all seen groups of people who share the same space but are interacting with hand-held devices rather than each other. Numerous studies conclude that increased time spent with electronics is associated with children spending less time outside. That makes me agonize about technology. But at the same time, I find technology can enhance my appreciation of nature in unexpected ways. Nestcams fascinate me. These cameras, unobtrusively mounted above an active nest, literally provide a bird’s-eye view of what goes on as parent birds raise young. This year, I followed a pair of Great Horned Owls—who nest in January and February—incubating eggs and feeding their two chicks. Like a proud aunt, I also experienced delight at seeing the babies fledge. I felt as though I had been invited into the owls’ living room, with the webcam offering an unparalleled peek of nature that I’d otherwise never see. Curiously, I’ve also come to genuinely enjoy Twitter. 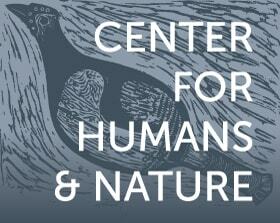 Through it, I find a wealth of nature and conservation information, as well as a community of kindred souls. From friends on Twitter—most of whom I’ve not met in person—I learn about plants for butterfly gardens, citizen science opportunities, and more. My “tweeps” inspire me to share and reflect on my relationship to nature. Tweets by friends in the Chicago region alert me to what’s happening nearby, keeping me more attuned to local nature. One Twitter friend—who lives about an hour’s drive away—tweeted a charming photo of a Sandhill Crane pair strolling just outside his basement door, looking as if they might walk right inside. I feel wonder, vicariously. Today’s online technology offers a world of possibilities to nature enthusiasts, such as birdwatchers. My husband, both an ornithologist and birdwatcher, has always meticulously recorded—through detailed lists—the birds he sees daily, noting locations, including site, county, and state for each sighting. For years, his lists existed only in little notebooks carried in his pocket. The advent of spreadsheet programs saw the transfer of his notebook records into a computer where he could analyze data in numerous ways. Another technological development—eBird—has become a lister’s dream. eBird—a website launched in 2002 by the Cornell Laboratory of Ornithology and National Audubon Society—allows users to record the birds they’ve seen, along with places and dates of the sightings. Once an individual enters data into eBird, he or she can generate lists for any range of species, dates, or locations. A birdwatcher can produce a list of bird species he or she saw in Glacier National Park on June 30th, 2010, or of all their sightings of Rose-breasted Grosbeaks in 2014. eBird also allows birders to see other birders’ entries. Documenting bird diversity in the United States and throughout the world, eBird is a significant scientific resource. In a single month, millions of observations may be recorded, and the data visualized via regional and national maps of bird species’ locations, densities, or movements. By amassing the collective observations of all users, eBird turns birdwatchers’ observations into an enormous citizen science database. Beyond its effects on my personal experiences with nature, technology is revolutionizing ecological and conservation research as well. Camera traps, for example, are an unobtrusive, non-lethal means of “capturing” wildlife. Cameras placed in areas utilized by wildlife, from national parks to urban golf courses, are triggered by motion sensors when an animal passes. From the resulting photos, scientists are recording rarely observed species and their behaviors. In autumn of 2014, a team from Chicago’s Field Museum placed a camera trap at a biological inventory site in Peru. Among the species caught on film was a rare, elusive canid endemic to Amazonian Peru, the short-eared dog. Even my husband, a team member who is content to see only good birds, thought this was cool. I’m still meditating on this question; the answer isn’t cut and dried. In the examples that resonate with me, technology enhances real experiences with nature, helping people chronicle their interactions—as with eBird or Twitter—or expanding one’s ability to gather information about other species, as with nestcams and camera traps. All of the technology-nature interfaces that I’ve mentioned are instances in which real interactions with nature are enriched by technology. Except, perhaps, for one—the Old Faithful webcam that inspired me to write this essay. Yes, the webcam is a reminder of my treasured experiences in Yellowstone. But while it’s similar to a nestcam, Old Faithful’s webcam shows an event that I can enjoy in person. Nestcams offer exceptional views of nature that aren’t possible first-hand. Contemplating this reminds me that I’m not making enough time for real nature experiences in my life right now. 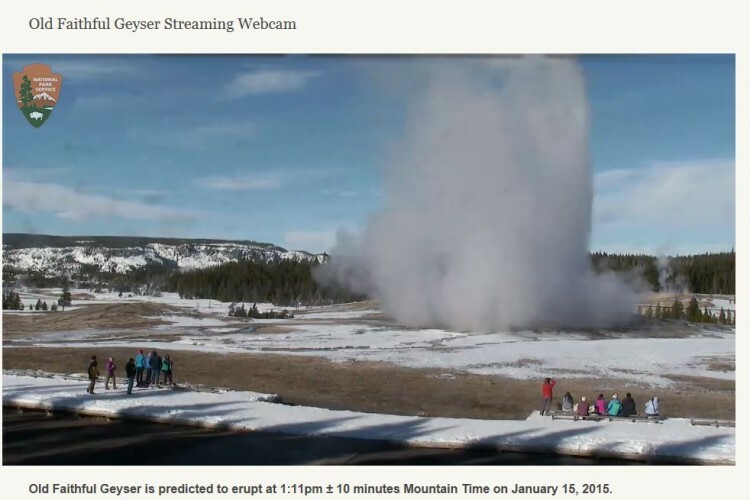 Vicarious wonder, like that of the Old Faithful webcam, has its rewards; it triggers emotional connections and engages sympathies. But it’s wonder at a distance, creating the illusion of immersion in nature. Perhaps the most important role technology can play in enhancing our experience of the natural world is as a prompt, a nudge to remind us that full-bodied immersion is required for full-bodied wonder. While a trip from Chicago to Yellowstone requires some planning, a trip to the prairie remnant one-half mile from my house doesn’t. Yet I haven’t been there lately. Instead, I’ve watched Old Faithful erupt from my desk. So if you’ll excuse me, I have a prairie to visit. All photos or screenshots are by Francie Muraski-Stotz (@FrancieStotz), excepting "Busy Kids," which is by Willem Velthoven (Creative Commons license 2.0) and "Short-eared Dog," which is by Smithsonian Wild (Creative Commons license 2.0).